We would like to recognize the Algonquin Nation, on whose traditional unceded territory Kitchissippi United Church is located. We gratefully acknowledge them as past, present and future stewards of this land. Over several years church members have taken steps to educate themselves about the history and current circumstances of Aboriginal peoples in Canada, and about the relationship between Aboriginals and non-Aboriginal peoples, including the legacy of the Residential Schools system. 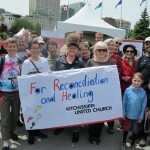 Church members have actively supported several campaigns and initiatives including Project of Heart, the Kairos campaign working towards the full implementation of the UN Declaration on the Rights of Indigenous Peoples in Canada, and the work of the First Nations Family and Child Caring Society. Kitchissippi United Church is committed to building caring and respectful relationships within our community, especially between Indigenous and non-Indigenous peoples. The Kitchissippi United Right Relations Circle was created in 2013 and has especially active over the past few years, as this year marked the release of the final report of the Truth and Reconciliation Commission. 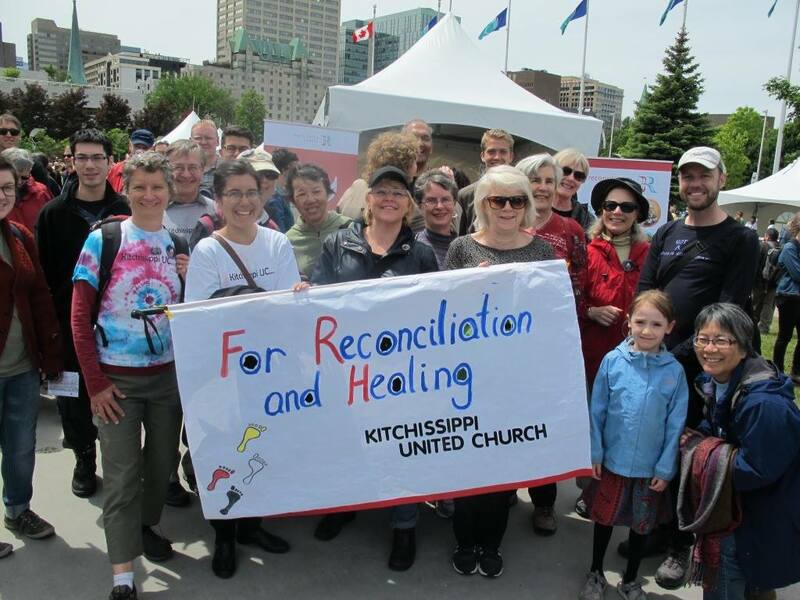 Many KUC members participated in the TRC’s closing event the Walk for Reconciliation (see photo) as well as a session of KAIROS’s Blanket Exercise, where participants learned the history of Indigenous and European relations from an Aboriginal perspective. Many of our outreach and community involvement initiatives are also tied to Right Relations. KUC has also collaborated with the Odawa Native Friendship Centre to raise money for Centre 510 an Aboriginal drop-in centre to help this non-profit organization provide key services to the Aboriginal community in Ottawa. As we move forwards with Right Relations at KUC, we continue to dedicate ourselves toward reconciliation and equality between Indigenous and non-Indigenous people in Canada.